The Next Stage: Women and Retirement: New Year’s resolutions: Why bother? The research literature on the value of resolutions is a mixed one, Karen, with one relatively consistent variable predicting success appearing to be self-efficacy, the belief that one has the requisite skills for some particular task. Other variables (the somewhat elusive motivation, social support) are less robust, though a varied behavioral repertoire also sometimes shows up as useful. 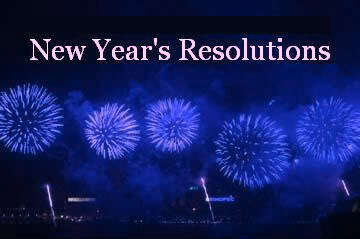 I also make resolutions but since it's not my blog I don't bear the burden of public accounting! If you'd like to check in privately in a month or two (research suggests that success at one month can nicely predict continued success at six months) I'd enjoy exchanging notes. (And I can't think of a soul who cares about your basement, or your leaves as long as they don't lay slippery on the walkway--you live amid beautiful trees after all.) A fine new year to you and yours! Just removed some leaves from the walkway! Karen, I have some of the same tendencies - make lists, fall behind - feel guilty. As I've gotten older, I've gone the other way and try to be a little easier on myself. I find if I look at what I actually get accomplished instead of looking at what didn't get done, I'm able to feel more satisfied and content. So no resolutions for me, but I do love reading yours and your blog. Thank you!